Are Bluetooth headphones superior to wired ones for outdoor sports? Until recently I was convinced Bluetooth earphones were one of the best accessories I could use on my bike rides. I have my iPhone mounted on my handlebars and with no wires attached. I can listen to music for the length of my ride, usually two or three hours, three or four times a week, without any impediments. With Bluetooth headphones, I never had to worry about getting tangled in a speaker cable. That was the good news. But when you ride, you sweat, and Bluetooth devices tend to be temperamental about moisture. After about 90 minutes, I started hearing warning beeps to let me know my BT battery was running low. Soon afterward, my earphones went silent. Time to recharge the batteries. I was annoyed. I still had seven miles to go to get back to my car. Bike riding is boring for me without music. Silence is nice when I’m having breakfast, but when I ride I want my tunes. Dead earphones are as unpalatable as cold coffee. They can ruin my day. Which is why I started carrying an extra set of earphones on my rides. The second set was a wired headset. One day I plugged it into my phone instead of the BT earbuds. Whoa! The music leaped from 1950s analog to 2016 digital stereo, or so it seemed. Trucks zooming by? Airplanes overhead? No problem. Volume, clarity and sound separation were so far superior to even my best BT earbuds that I was amazed. As long as I can hear some outside noise, I feel safe. The earphones don’t cancel out all sound. I poked around the Internet trying to figure out what might be affecting the life of the BT batteries. The louder you play your music, the shorter the lifespan of your batteries. And if you sweat a lot, that interferes with battery life. One day my batteries lasted 2.5 hours. Many of the BT 4.1 earphones claim they’ll last up to 12 hours before needing to be recharged. I’ve never had that experience. Dangling audio wires can be a nuisance, but frankly I haven’t found that to be a big deal. If I can hear my music reliably and at a level I enjoy, and not have to worry about charging up the BT battery every time I head out for a ride, an audio cable becomes an insignificant compromise. On the other hand, if I’m just sitting in front of my computers or lounging on the porch, BT earphones are fine. It’s when I’m away from home that their finicky battery life becomes an issue. If you’re considering getting earphones for cycling, keep in mind you will pay more for BT devices. 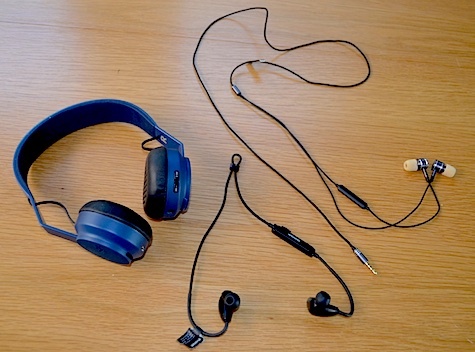 Wired earphones are inexpensive and can provide a better audio experience. They never need to be recharged. Plug them in and listen. What could be simpler?